European governments have refused to support a European Commission plan to grant a 5-year renewal without safety restrictions for glyphosate, Europe’s most widely used weedkiller, which has been linked to cancer and environmental harm. 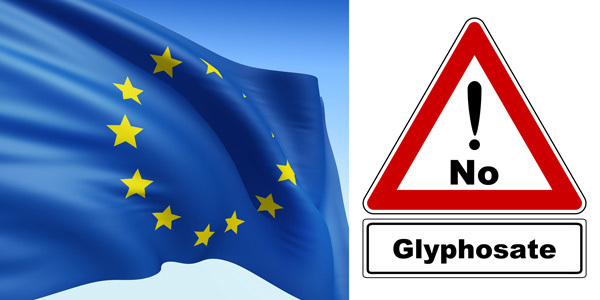 This is the European Commission's 7th failed attempt to get glyphosate renewed. And the rejection of this latest bid for a 5-year renewal was an even worse result for the Commission than the vote on its previous 10-year proposal. That renewal bid had the backing of 16 countries but only fourteen voted in favour of the 5-year renewal, with as many either voting against, or, like Germany, abstaining from voting. 14 Member States (representing 36.95% of EU population) CZ, DK, EE, IE, ES, LV, LT, HU, NL, SV, SK, FI, SE, UK voted in favour. 5 Member States (30.79% of EU population) BG, DE, PL, PT, RO abstained. The qualified majority necessary to grant a new EU licence requires support from countries representing at least 65% of the total EU population, but the countries that voted for renewal represent less than 37% of the population. The UK, which is one of the most committed glyphosate supporters, is preparing to leave the EU. As it has nearly 13% of the EU’s population, with the UK out of the equation post-Brexit, the states currently voting for glyphosate renewal would represent less then a quarter of the EU's population! On 24 October MEPs at the European Parliament voted to ban glyphosate altogether. There were 355 votes in favour of banning glyphosate, 204 against and 111 abstentions. The MEPs called for restrictions on its use from 2018 and a full ban by 2022. What happens next on glyphosate? contains no credible legal mechanism to implement the EU Parliament’s and many member states’ demands for a phase-out and leaves the door open for future renewals. The Commission’s proposal is expected to fail to gain enough support in the appeals committee. Thereafter, the Commission has the power to adopt its own proposal without the backing of European governments. According to a legal opinion from the Paris law firm Huglo Lepage, the procedure for renewing the authorization of glyphosate is "illegal". The European Commission is preparing to propose to the European states to renew the license of the product for five years. A pending decision on Monsanto’s weedkiller glyphosate is a crucial opportunity to protect our children from the toxic cocktail of pesticides polluting their food, water and play areas, writes the UN’s special rapporteur on human rights and hazardous substances and wastes. Farming without glyphosate — would it work? Hella Kehlenbeck from the Julius Kühn Institute, a plant research centre linked to Germany’s agriculture ministry, believes that “Fundamentally, agriculture can manage without glyphosate.” In her research, she estimated the possible costs of a glyphosate ban for German agriculture and found that farming without herbicides "doesn't have to be more expensive in all cases" – much depends on the farming conditions. Claims of environmental benefits for no-till farming with glyphosate are unfounded and the sky won't fall in if the chemical is banned, writes nature conservation expert Miles King. In a new study, mice exposed to a glyphosate herbicide through inhalation became more anxious than controls. Their central nervous systems were affected in ways that affected movement, anxiety, and memory. Corporate Europe Observatory has summarised the content of several new Monsanto papers, which were released on 27 and 28 October 2017. These documents show, among other things, the possibility that the European Food Safety Authority (EFSA) dismissed the IARC monograph that pronounced glyphosate a probable carcinogen before it was even published. Farmer-scientist group MASIPAG has slammed PhilRice (Philippine Rice Research Institute) for its renewed push to open field test and feed test GM golden rice. The farmers believe the force behind this push is golden rice patent owner Syngenta and other giant GMO corporations including Monsanto. In a recent study, scientists showed that the derived lines of golden rice produced phenotypic abnormality and poor yield performance, making it unfit for commercial cultivation. Farmers are worried that the trait can transfer to other rice varieties and contaminate them. Goodbye to golden rice? GM trait leads to drastic yield loss and “metabolic meltdown"
For nearly 20 years, GM golden rice has been promoted as a potent tool to alleviate vitamin A deficiency. Golden rice has never been commercialised, however, and its failure to reach the market has been blamed on “over-regulation” and on “anti-GMO” opposition. But recent research by Indian scientists shows that introducing golden rice transgenes had unexpected detrimental effects. Their high yielding and agronomically superior Indian rice variety became pale and stunted, with yields so reduced it was unsuitable for cultivation. For the first time, illegal cultivation of a GM food crop — GM soybean — has been reported in India. Bhartiya Kisan Sangh (BKS), a national farmers organization, has said that Gujarat farmers have been cultivating herbicide-tolerant crop illegally as there is no clearance from the government for any GM food crop yet. In the wake of pesticide-related deaths of farm workers in Vidarbha, the state government wants India’s central government to denotify the Bt cotton seed strain Bollgard II. Under Indian law, notification of a seed variety is a necessary step in certifying it as fit for purpose. Denotifying Bt cotton seed would be an acknowledgement that it doesn’t perform as claimed. India has frozen requests to commercially release a GM mustard, an environment ministry document showed, amid stiff opposition to lab-altered food from domestic activists and politicians. The Bangladeshi government plans to incentivise farmers to produce more GM brinjal despite not having conducted any tests on its possible impact on human health and the environment. Switching to a non-GMO diet can transform health for the better, according to survey results reported in a new peer-reviewed article by Jeffrey M. Smith. Out of 3,256 people who responded to the survey, a remarkable 85.2% said their digestive health improved on changing to a diet without GMOs. Other conditions, including obesity, allergies, and “brain fog”, improved also. In 2017, not one hectare was sown with GM maize in the Czech Republic and in Slovakia. And in Portugal and in Spain, the planting area of transgenic crops decreased. All in all, throughout the European territory, this surface declined from 136,338 to 130,571 hectares, a decrease of 4%. French health and environment regulator ANSES said it had withdrawn the licence for Bayer's Basta F1 weedkiller made with glufosinate ammonium, citing uncertainty over its effect on health. Glufosinate herbicide is used on the set of GM crops that are engineered to tolerate it. A new peer-reviewed report finds that NGO opposition to genome editing cannot be dismissed as being emotional or dogmatic – but is based on scepticism of the inflated claims being made for the technology. GMWatch was among the NGOs contributing to the focus group findings that led to the report. Civil society representatives firmly rejected GMOs as a means of addressing world food security at a recent Food and Agriculture Organization meeting in Malaysia. The event was funded by the pro-GM US, Canadian and Australian governments. In the US, organic corn sells at almost triple the price of conventional corn. Demand from organic dairy and poultry farms is supporting the hefty premium prices for organic corn and soybeans that are used in animal feed. Production of those crops jumped 30% in the US from 2015 to 2016. An Arkansas regulatory panel has voted to ban the use of dicamba herbicide, which is sprayed on GM dicamba-tolerant crops, for part of next year after the weedkiller drew complaints from farmers across several states who say it has drifted onto their crops and caused widespread damage. Monsanto has sued Arkansas regulators for banning its version of dicamba herbicide over its tendency to drift onto farmers’ crops and cause widespread damage. Insurance companies are refusing claims from farmers whose crops are damaged by drifting and volatilizing dicamba herbicide. The weedkiller dicamba has damaged more than 3.6 million acres of soybean crops, or about 4% of all soybeans planted in the US this year, the US EPA said in calling for an urgent federal response. “It is not often that we hear about impacts of this magnitude,” said Rick P. Keigwin Jr, director of the EPA’s pesticide programme. As part of any trade deal with the US in the wake of Brexit, the UK government should jettison EU restrictions on chlorinated chicken and GM food, according to the US commerce secretary Wilbur Ross. The US Dept of Agriculture (USDA) has withdrawn a plan to overhaul how it regulates GM crops and foods. The proposed rules, released in January as part of a broader update to federal GMO regulations, would have formally exempted some modern gene-edited plants from regulation, but industry and academic groups worried it would add more onerous requirements for safety assessments early in the development of such products. Glyphosate: Less toxic than table salt? Glyphosate, the key ingredient of Monsanto’s Roundup herbicide, is less toxic than caffeine and table salt. That’s according to an infographic ‘signed’ with the Twitter name of Monsanto social sciences lead Cami Ryan, which has been doing the rounds among glyphosate supporters on social media. But now scientists have hit back against this Monsanto-linked meme, which aims to reassure us about the safety of the controversial weedkiller. In her new book Whitewash: The Story of a Weed Killer, Cancer, and the Corruption of Science, investigative journalist Carey Gillam makes the argument that the chemical industry — particularly Monsanto — has spent decades deceiving the public about the dangers of Roundup, the popular weedkiller. Since 1973, Monsanto has cited dubious science to keep glyphosate on the market, like tests on the uteri of male mice, and the US EPA has let much of it slide. This article is long but it’s well worth a read. It encapsulates the reasons why no one can trust regulatory reports claiming that glyphosate is safe. Did Monsanto influence Henry Miller, founding director of FDA’s Office of Biotechnology, on how GM foods should be regulated by FDA? Belinda Martineau, who helped develop the first GM food, asks this question and offers some insights from her own experience. A new grant means that the Bill and Melinda Gates Foundation has now given $12 million to the Cornell Alliance for Science. But according to Claire Robinson of GMWatch, the Alliance "is a propaganda machine for the GMO and agrochemical industry”. The World Health Organisation’s cancer agency IARC has published a robust response to Reuters reporter Kate Kelland’s attack piece, which she admitted was fed to her by Monsanto. Kelland has attacked IARC since it published its report finding glyphosate a probable carcinogen. A leading environmental health and carcinogenity expert, Dr Christopher Portier, is being targeted by attacks from the pesticide industry and its allies which aim at undermining his reputation as well as that of IARC, the body that found glyphosate a probable carcinogen. Corporate Europe Observatory deconstructs the accusations against Dr Portier in a detailed article. The GMO propaganda film Food Evolution is a “mockery of science” that will only serve to “raise questions about the credibility of the endeavour of science itself unless recognized and identified for what it really is”, writes Dr Doug Gurian-Sherman in a detailed evidence-based critique.